Defense Minister Moshe Ya'alon visits the home of First Sgt. Oron Shaul, promises Israel will do everything it can to retrieve his body. Defense Minister Moshe Ya'alon visited on Sunday evening the home of Golani fighter First Sgt. Oron Shaul, who was declared a fallen soldier whose place of burial is not known by the IDF Chief Rabbi. 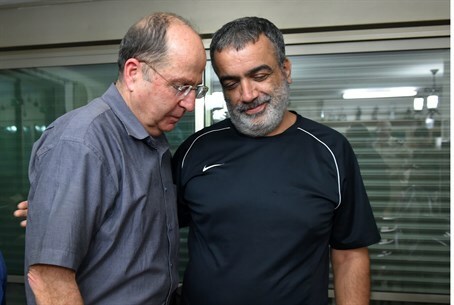 During the visit, Ya’alon promised Shaul’s parents that Israel will do everything it can to retrieve his body. "We are committed to bringing Oron for burial in Israel. We will not rest until that happens, and we are dealing with it and committed to it," Ya'alon told the family. "We'll be sure to update you on any developments, and my door is open to you for any question. Unfortunately we are experienced in such cases, and unfortunately I came across them also during my military service,” he added. "It is clear to us that Oron’s body is in the hands of Hamas, and we are making every effort to bring it back," the defense minister promised. "The Prime Minister and I are working to make this happen." A source in the Palestinian delegation to Cairo said on Saturday that Israel offered to hand over 25 terrorists that it arrested during Operation Protective Edge and 18 bodies of terrorists who were killed, in exchange for the bodies of Shaul and of Lt. Hadar Goldin. According to report in Al Masry Al-Youm, Israel demanded that the bodies of its soldiers be returned as a condition for the negotiations to proceed. The report was not confirmed by any official Israeli sources.